Every day we receive hundreds of calls from stranded motorists nationwide who have put petrol in their diesel car. Don't worry, on average 1 person every 3 minutes puts the wrong fuel into their car, so you're not alone. Call us to book your fuel drain. Here is some information we have compiled for people who have put petrol in a diesel car. Filling up with the wrong fuel these days is a common thing. It happens, on average, every 3.5 minutes just in the UK! Don't worry, call the UK's number 1 Wrong Fuel Emergency Service today. We will normally be with you within the hour and make sure you are back on your feet as quickly as possible - anywhere in the UK! Putting petrol in a diesel car is generally not a major issue, as long as you have it removed. In fact, if you have not put much petrol in your diesel tank (under 5%) you might even get away with running the car. Our professional advice, however, is always to have the mixed fuel removed from your car as soon as possible for complete peace of mind. Even if you are not sure what to do and want advice about the wrong fuel in your car you should seek professional help. Call our National Control Room on one of the numbers above for further advice. In line with car manufacturers' recommendations, Fuel Doctor advise that any diesel fuel contaminated with petrol should be removed from the tank and replaced with clean fuel before the ignition is turned on and the car started. In some cases this may not be possible but care and consideration should be taken. The best course of action is to seek advice from professionals who have a full understanding of the mechanics and electronics involved with the fuel system. "If you are unfortunate enough not to realise your mistake of putting the wrong fuel in your car whilst filing up and have switched on the ignition the damage could be more costly. Fuel could be contaminated by the pump wear caused by lack of lubrication and if this reaches the injectors, low and high pressure pumps, filters and the fuel tank it can mean that all of these parts will need to be replaced. However, do not fret, we have had customers that have filled their cars up with the wrong fuel and got all the way home and realised their mistake after. We have still managed to drain the fuel from their car and there have been no ongoing issues. Whatever the situation, don't panic. If you have managed not to turn on the vehicles ignition you may be able to remedy the situation quite simply and at a comparatively lower cost." These are the best practices if you put the wrong fuel in your car, follow them in the number order and make sure you call us as possible from your location. 1.Inform the staff at the petrol station that you have put the wrong fuel in your car. They will normally be very sympathetic because they see it all the time! They may even be able to recommend a company to help you. All we suggest is that you ring a few companies for quotes! You shouldn’t have to ring a mobile number or pay in advance – all Fuel Doctor vehicles can take card payments at the roadside. 2.Do not turn on the ignition or start the vehicle - if you have already started the engine and driven your car then it’s not a problem, the fuel can still be drained. At Fuel Doctor we do not charge any extra because the vehicle has been driven but it is important to make sure we know. If the vehicle hasn’t been started then the contaminated fuel is just in the tank and not circulated through the rest of the fuel system. Often the staff at the filling station will be able to help you to push your car. 3.Make sure your car is in a safe place and not obstructing traffic or a danger to yourself or anyone else around you. Sometimes when you put the wrong fuel in your car and don’t realise it, your car may run for a couple of miles. If the car starts to jerk and jump you know to pull over as soon as possible and call for assistance. Find a suitable, safe place to stop before you call us. Please have as much information about your location as possible – Road names, postcodes, even just a shop name can help to pinpoint your location and enable your local Fuel Doctor to find you quickly. 4.Sit back and await the arrival of your chosen Fuel Drain company. If you have booked with Fuel Doctor then the nearest available technician will call you, normally within 10-15 minutes, with an accurate arrival time. We will also keep you updated if the technician encounters any delays. 5.Try to relax! 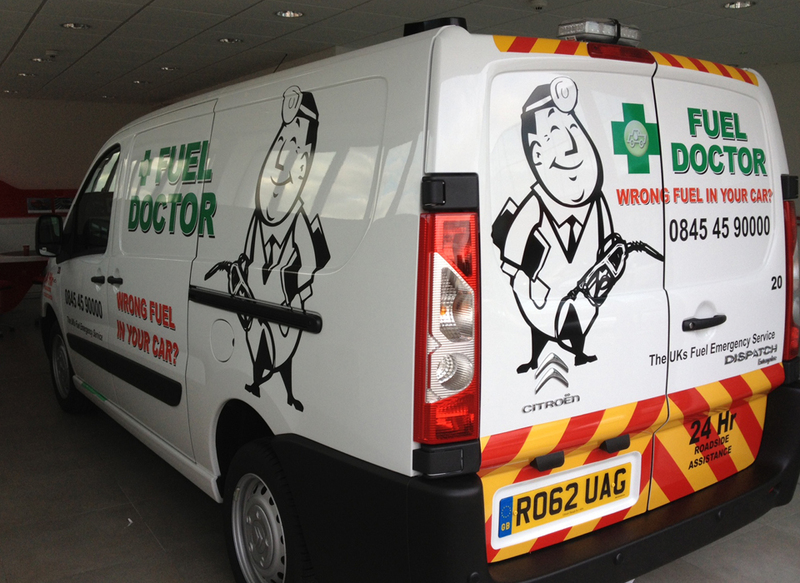 All Fuel Doctor Technicians are highly trained in fuel systems and fully insured. When your technician arrives you will be in safe hands! You will be guided through the strict procedures we follow and any questions or concerns you may have will be dealt with by your dedicated Fuel Doctor. 6.Upon completion you will be advised to fill your fuel tank completely at your earliest convenience. Drive away with a smile and safe in the knowledge that we have done everything possible to rectify the wrong fuel in your car in safe and professional manner. "I was coming back from work in a rush for New Years Eve to get things ready for a home party when I stopped in the petrol station to refuel, I had only had my new car two weeks and was used to putting petrol in, not diesel. In my rushing about I put the wrong fuel in my car putting petrol in my new diesel car. The car started, then after a minute began to jump a little bit, then I realised the horror of my mistake. I was 6 miles from home but it seemed like 3,000, I quickly searched online "put the wrong fuel in my car" and Fuel Doctor came up so rang them up. They turned up in 40 minutes, drained the fuel out of my car by the roadside and put the diesel in for me. The price was great considering the effort they have to go through and within an hour I was back up and running and my car was like new again. I have never put the wrong fuel in my car again ever, however, if I do, then I will make sure I call Fuel Doctor. Thanks for saving my New Years Eve!" "I put the wrong fuel in my car after buying a new diesel car, I just didn't think, I put £25 worth of petrol in the car and only realised I had made the mistake when as I put the fuel nozzle back! I then searched online about it and the man in the garage told me to call Fuel Doctor who would come out a drain the fuel from my car. So I called them up and within an hour a Fuel Doctor was out, drained the fuel out of my car and put £25 worth of diesel back in the car for me. I was back in the road in 90 minutes. It's a mistake anyone can make, when you are used to putting petrol in your car and then you move to a diesel, it's easy to put the wrong fuel in your car. Thanks to them it was not an issue and didn't harm the engine!" "Thanks Fuel Doctor, you saved my bacon. I put the diesel in my petrol car and managed to get home which was round the corner. It wasn't until the next day that it clicked that I had put the wrong fuel in my car and found Fuel Doctor on the internet. They were round in half hour, had a cup of tea and they put the petrol back in my car to get me back to the petrol station. Really simple, don't read the horror stories on the internet about how you might need to get a new engine, just call Fuel Doctor." The majority of the time we can help our customers who have put the wrong fuel in their cars right by the roadside. In fact, it is very rare that a vehicle needs any further attention once a Fuel Doctor Technician has completed his work. We have developed our own, innovative and custom built system to drain the contaminated fuel from your car, getting you back on the road with the minimum of fuss. No matter if you have put petrol in diesel or diesel in petrol, we have a safe and simple method to get you back on the road in no time. 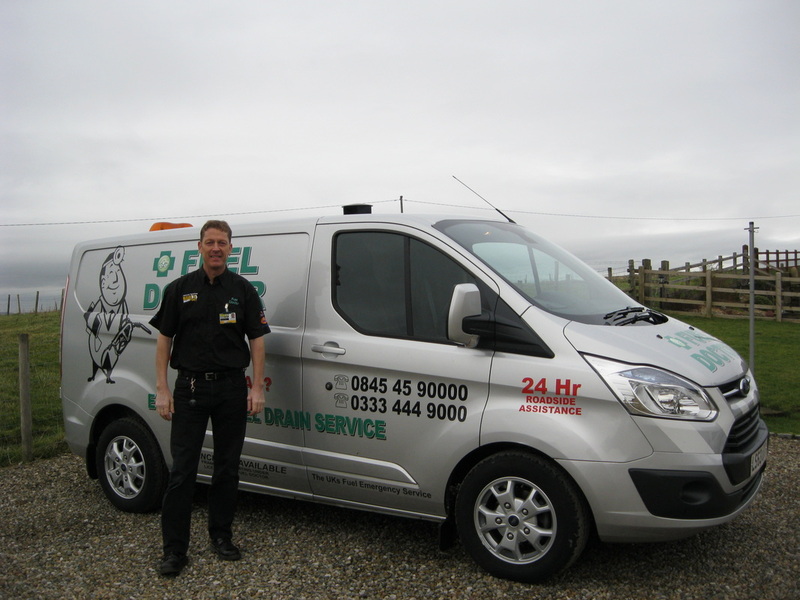 All our vehicles are fitted with all the latest developments in fuel drain equipment. We can safely hold over 250 litres of contaminated fuel in each of our vans which means we can get to each customer as quickly as possible. ​Generally speaking, from the initial contact with our National Call Centre we will have a dedicated Fuel Doctor with you within an hour. Wherever you have put the wrong fuel in your car, one of our Fuel Doctors will be on hand to drain the contaminated fuel from your car and provide you with the correct fuel. The whole process usually takes around 30-40 minutes, depending on the individual vehicle and how much fuel is in the tank. If the vehicle has been started then your Fuel Doctor will draw the correct fuel through the engine and flush out the contaminated fuel from the system.